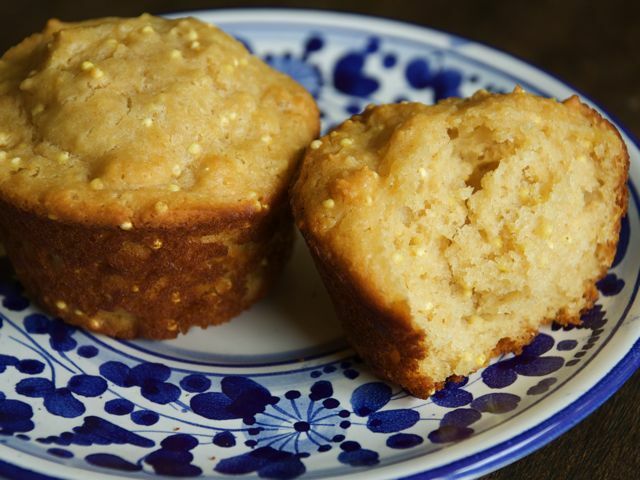 Durable but not dense, sweet but not sugary, crunchy, and just a smidge lemony — this is what my friend Jess Thomson had to say about her millet muffins. It was just enough to convince me to get a batch in the oven. They bake into golden-topped perfection: moist, honey-kissed, and delightfully textured. My two-year-old nephew loves them plain, but I think they're perfect slathered with salted butter and boozy roasted strawberries. Preheat the oven to 400 degrees, with a rack in the top third of the oven. Butter a standard 12-cup muffin pan or line with paper liners. Whisk together the flour, millet, baking powder, baking soda, and salt in a large bowl. In another bowl, whisk together the yogurt, eggs, butter, honey, and lemon zest and juice until smooth. Add the wet ingredients to the dry ingredients and stir just until the flour is incorporated. Divide the batter among the muffin cups, spooning a heaping ¼ cup (60 milliliters) batter into each one, filling it a bit below the rim.